Don’t get us wrong. Chiffon Parfait has beautiful, lovely flowers. But that’s not the main attraction here. No, it’s the fragrance of this variety that’s got us head over heels. If you love flowers with a best-in-class fragrance, Chiffon Parfait is perfect for you! 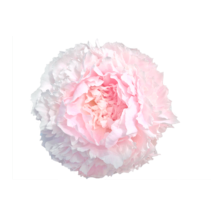 Chiffon Parfait is a full-petalled peony with easy-opening, bomb-shaped flowers. The flowers can grow to be about 15 cm wide. The petals are pale pink and get increasingly paler to the centre during blooming. A nice contrast with the sturdy, green stems and leaves. Chiffon Parfait was registered in 1981 by famous American peony breeder Roy Klehm. Feel like turning your house into a perfumery or do simply just love flowers with a marvellous fragrance? Chiffon Parfait is the peony to get! This cheerful peony is also an ideal choice for (wedding) bouquets.